Battery safety is of the upmost importance whether you are using a built in battery or external batteries. 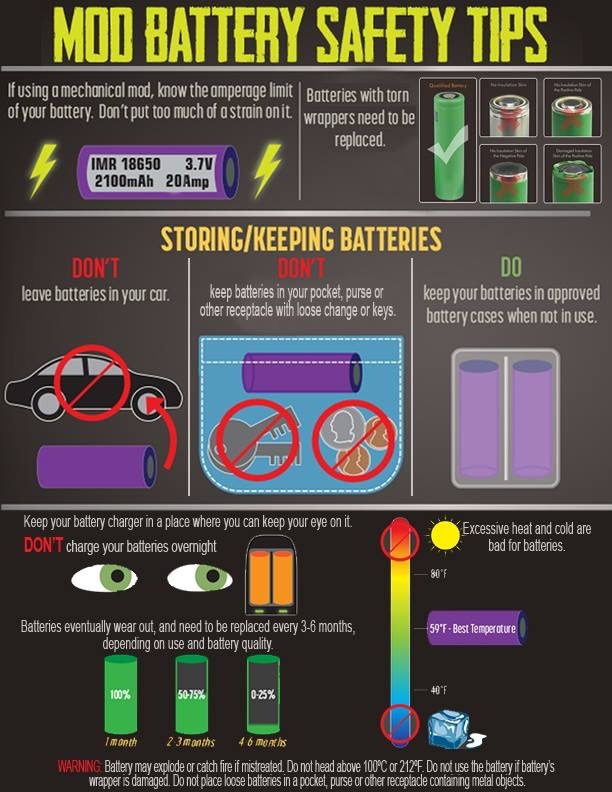 And for your own safety we here are with some tips to stay safe and ensure your batteries are charged correctly and safely. With an internal battery Mod you should always make sure you charge using a 5v 1amp source, this means using a home PC or home laptop so it is a ‘trickle charge’. If you don’t have these to hand we can Alternatively we provide you with the correct wall plug in store at a small cost to ensure your Vape is charged correctly. Do not use output sources such as mobile phone plugs/tablet plugs/the back of a TV/ USB ports that may be in your home or in a car. And never leave on charge over night. External battery Mods should be charged by removing the batteries and charging via an external battery charger available to buy in store at The Vape Hut Maldon. There is good reason for this method as you are constantly checking the condition of the batteries whilst removing and also will ensure the batteries are charged using a ‘trickle charge’. Never use mobile phone plugs or charge in a car, and never leave on charge over night. Most manufacturers will state it is safe to charge in the Mod, however we strongly recommend an external charger.